Note: When Multiple Grading Periods are enabled in a course, assignments are also respected against closed grading periods. Some attributes may not be available to editing. Type the assignment title in the Assignment Name field . If you created your assignment as an assignment shell, this field will be populated for you, but you can change it if necessary. Use the Rich Content Editor to add images, text, links, equations, or insert media . 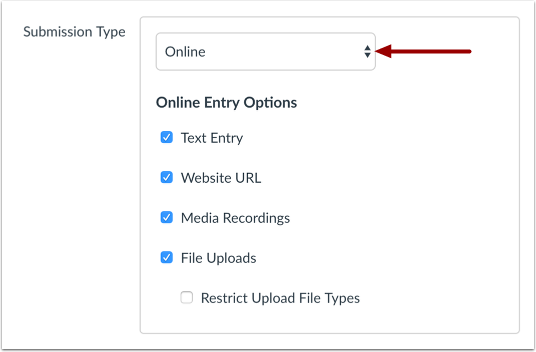 Use the Content Selector in the Sidebar to link to or upload course resources, including files and images . Note: The grading type is how the assignment score will display in the Gradebook. For example, an assignment worth 10 points is set to display as a percentage. A student who receives 8/10 points on the assignment will show as 80 in the Gradebook. If using a letter grade, learn how to create a grading scheme and apply a grading scheme to your assignment. In the Submission Type drop-down menu, select the type of submission you want to accept for the assignment. By default, the submission type will be set to Online. No Submission is when you do not want students to submit an assignment in Canvas. This assignment type can be used to create extra columns in the Gradebook, or when you want to create an assignment that involves multiple scores. Submission Type does not apply to Not Graded assignments. 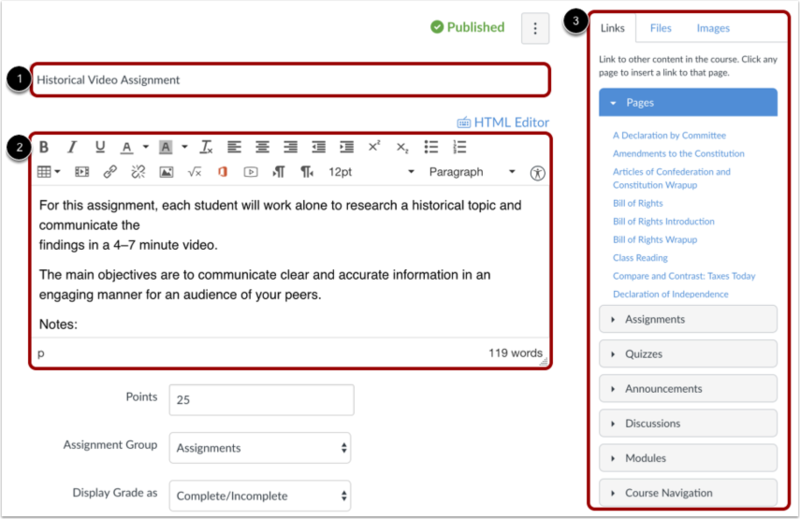 Online is when you want students to submit their assignments using Canvas. On Paper is when you want students to submit an assignment to you but not through Canvas. This assignment type applies to traditional face-to-face courses or hybrid courses when you want the assignment turned in during class, but you still want to create a column in the Canvas Gradebook for grading purposes. Assignment settings are persistent to always remember and display the settings created or edited in the previous assignment in the course. Based on prior assignments, one or more of these options may already be selected for you. 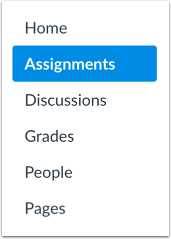 As part of an assignment submission, Canvas lets you set up an assignment as a group assignment. You can also choose to grade students individually in group assignments. If you want to require students review each other's work, you can create a peer review assignment. 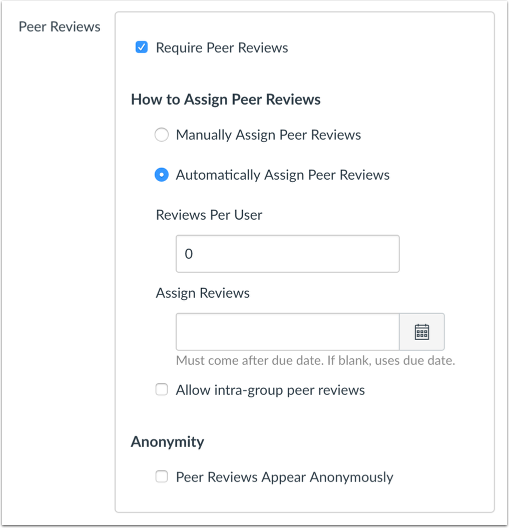 When requiring peer reviews, you can select whether to manually assign peer reviews or automatically assign peer reviews. If you want to set up an assignment with additional reviews, you may be able to enable Moderated Grading, Anonymous Grading, or both. Moderated grading allows multiple graders to evaluate a student's work and create provisional grades. Anonymous grading hides student names from graders when they view assignment submissions in SpeedGrader. These options can be used together or independently. If you want to assess submissions with DocViewer and make all instructor annotations and comments in DocViewer-supported submissions anonymous, select the Anonymous Instructor Annotations checkbox. By default, Canvas will set your assignment dates for everyone in your course . However, you can assign the assignment to an individual student or course section. 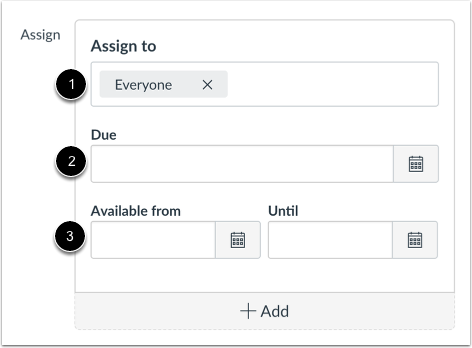 Create a due date for the assignment in the Due Date field . The due date will already be populated for you if you created an assignment shell, but you can change it if necessary. You also have the option to add availability date fields . Previous Topic:How do I add an assignment using an external app? Next Topic:How do I add or edit points for an assignment? Table of Contents > Assignments > How do I add or edit details in an assignment? How do I set up a Practice LTI integration in my Canvas environment?